Up and coming Chicago producer, drummer and DJ, COFRESI, pushes the boundaries of modern performance and digital production with a hybrid style melding together aspects of futurbass, soul, r&b, glitch, trap, dubstep and sample based production. Whether producing, drumming or DJing, he creates a versatile sound that’s provocative, rhythmic and heavy hitting while executing live sets full of energy and his unique ability to incorporate live multidimensional digital and acoustic percussion with modern electronic music. LYFTD has come bursting out of the thick Denver scene with its high-energy futuristic sound. 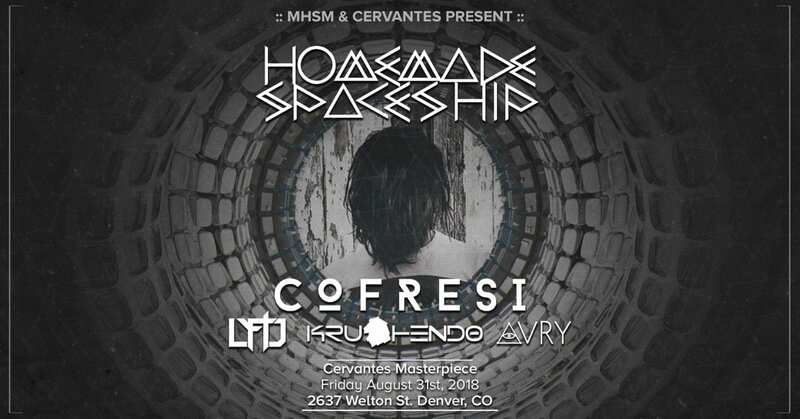 And now with several nationwide festivals under their belts, including Electric Forest and Summer Camp, these funky mammals are ready to dive back into the Denver Scene and make a name for themselves in their home state. LYFTD is pushing new boundaries with their unique sound and delivering shows that resonate with all music lovers. Performances are a roller coaster of a ride with a main objective of getting the party people moving! Krushendo is a Colorado future bass, trap, and dubstep music producer. He has been producing for almost 10 years and has been playing some type of music for the past 15 years ranging from guitar to vocals a metal band. Krushendo recently won On The Road to Summer Camp in a battle of the bands type event to go play Summer Camp Festival, he also selected as a finalist by The Untz.com for a chance to win a spot at 6 festivals, was featured in The Scene Magazine, 303 Magazine, and has also recently seen press from Colorado Culture and iEDM.com. He has been featured on music blogs and Youtube channels including Trap and Bass, Trap Nation, Cloudkid, Indiemono, EDMjoy.com, Dancing Astronaut, and Future House Cloud. He has shared the stage with So Down, Hippie Sabotage, Slander, Ryan Viser, Unlimited Gravity, Project Aspect, Toy Box, Awol, Tyro, Run DMT, Shank Aaron, Skydyed, Luczid, Orphic, Brothel, Homemade Spaceship, Miss Jaedha, Write Minded, Lucid Vision, members of the Disco Biscuits, J.wail, Jimeni, TwoScoops, Full Metal, iLLBanks, The Magic Beans, Indra, Niraya, and many other Colorado local artists.